Thank you for taking our PCOS Quiz. Please enter your name and email below for your results. You agree by submitting your name and email, to occasionally receive information and updates on PCOS from drfionand.com, you understand you can opt out at any time. Each woman with PCOS is different! Focusing on the factors which are strongest in your case (moderate and especially severe) will give you the most results with your health. Since PCOS changes throughout a woman’s lifespan, if at any point your symptoms change (ie: your cycles become regular), you can retake the quiz and learn what to focus on next! Below you’ll find a description of each factor and how it impacts your PCOS as well as resources to help you understand more. Evidence suggests that chronic low-grade inflammation is the central factor in PCOS. Inflammation is the crucial immune system activity which resolves infections and allows us to heal after injuries. However when inflammation is present constantly, as it is in PCOS, it can disrupt our hormones, cause cardiovascular disease, and contribute to insulin resistance. Women with PCOS secrete larger amounts of insulin than average, resulting in what is known as insulin resistance. Excess insulin causes the production of androgens like testosterone, disrupts the menstrual cycle and increases the risk for type two diabetes. The adrenal glands secrete the stress hormone cortisol as well as androgenic hormones like DHEA-S. High cortisol is associated with increased abdominal fat gain and sleep disturbances. High DHEA-S contributes to elevated testosterone. Female hormones like estrogen and progesterone are produced from ovulatory function. In PCOS, this process can be affected by excess testosterone, causing irregular menstrual cycles, infertility, changes in mood and even increasing the risk for endometrial cancer. Androgens are a class of hormones similar to testosterone, which are often elevated in PCOS. They are associated with hirsutism, acne, and hair loss, and increased amounts are central to PCOS. Women with PCOS have an increased incidence of Hashimoto’s Thyroiditis, an autoimmune condition that is the leading cause of hypothyroidism. Hypothyroidism makes PCOS symptoms worse by slowing the metabolism, increasing insulin resistance, and affecting the mood. A key component to care for PCOS is nutrition given that insulin resistance and inflammation can be impacted profoundly by diet. Many chemicals in our environment are classed as endocrine disruptors. These chemicals include plastics, flame retardants and pesticides, and have been found to impact reproductive development and even induce PCOS in animal studies. 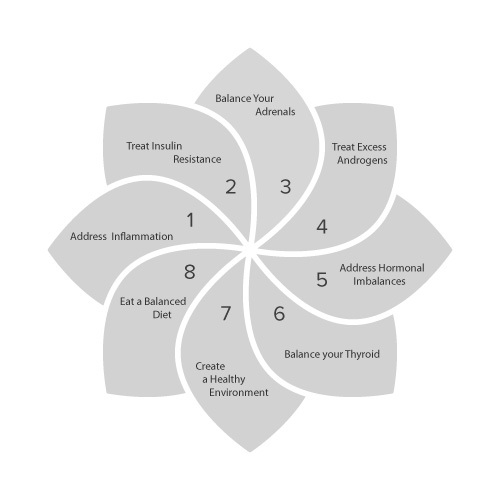 Now that you understand which specific factors affect your PCOS, you can go deeper and work on the areas that will improve your health the most. 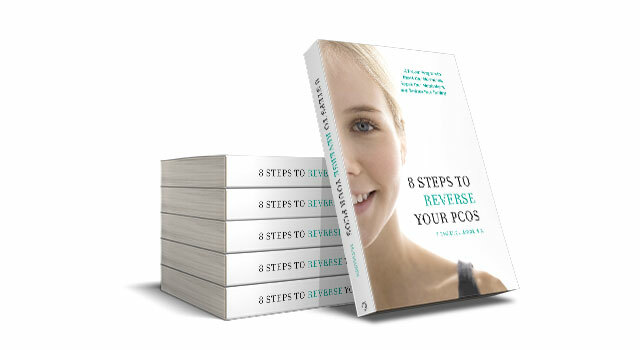 My best-selling book, 8 Steps to Reverse your PCOS has a chapter on each of the 8 Factors. If you score severe or moderate on a factor please read those chapters carefully and implement as many of the suggestions as you can. If you haven’t got the book yet you can order a copy here!